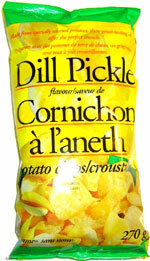 Taste test: These were good, thin and somewhat crunchy pickle-flavored potato chips with a sharp dill pickle taste. They were very vinegary and tasted pretty good. Smell test: Very strong pickle aroma. This snack was discovered by Jeremy in Niagara Falls, Canada. Review published .